Thanks to a media savvy reader (thank you Cynthia!) , I was able to email some photos to my Flickr account. They took about 8 hours apiece to leave my outbox, so there aren’t many at this point. But a few photos are better than none. Know that there are almost 1,000 that need to be looked at, organized, and the best will appear on this blog. It just may take me a bit. Randy and I are sitting in the Capetown airport waiting for our flight to London. We will have a 9 hour layover and then finally the flight home to Seattle. We left the game park yesterday around 11am so when all is said and done, it will take us over 3 days to get home. The trip has been amazing, more than I can truly process at this point. We saw and did so much. We had so much quality time together. We met some great people. I read and read and read and read. Such a luxury. But now, still 10,000 miles away from home, I am missing my boys so much my heart hurts. I know they have been well cared for, that their lives continued to follow routine while our lives were drastically different. What an incredibly lucky woman I am for all that I have, all the love in my life, and all that I can look forward to back home. We are about halfway through the safari portion of our trip. There have been many surprises for us. The first being that we are not in Kruger National Park after all, but a private game reserve called Zulu Nyala, about 200 kilometers south of Kruger. It is hard for me to believe that we traveled so long and so far and essentially had no idea where we were going. Fortunately, the people who were supposed to pick us up arrived on schedule and here we are. I had imagined the three hour drive to the park being in an open-air jeep on dirt roads through the savannah, but in fact we were in a van on a modern highway through incredibly lush, green, rolling hills. 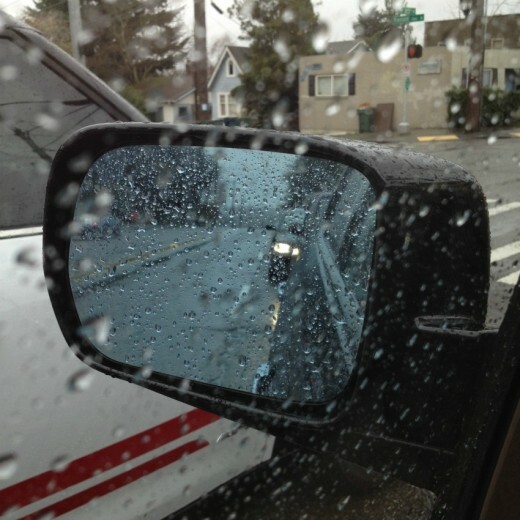 Randy thought we would drive through rain forest, so we were both wrong. At the park, there are two game drives per day, one starting at 6am and one starting at 4pm and on three of them we have seen wildebeests, warthogs, zebras, cheetahs, elephants, hippos, giraffes, rhinos, buffalo, and lots of impala. Also a few spiders that were terrifyingly large with webs the size of small cars. We are still on the lookout for crocodiles and a leopard that roams between this park and the one next to us. This is a Big 4 game park and there are no lions, but we plan an afternoon trip to the park next door to hopefully catch them. As most people who have seen animals in the wild will tell you, there is no substitute for this experience. Even though this is “game park lite”, meaning that the animals are protected here and we see the same ones over and over, it is still them living in their natural habitat and getting very close to them with a guide who knows a lot about them and their habits. We were lucky enough to see three elephants, a teenager, her mother and her aunt, full on swimming in the watering hole. Not just getting wet on the shore but completely in the water. They were blowing water on each other, tackling each other, huge beings surprisingly graceful and lovely in the water. It was very moving. As they moved to get out, the calf put her trunk on her mother’s back, just as if a child was asking to hold the hand of its mother. I had just read a bit about elephants and how intelligent, social, and family oriented they are, so it was especially amazing to witness this display. Anyway, more once I am back home and have a few hours (or days) to sort through our images. We are feeling very far away, very thankful to our loved ones who are keeping our children safe and happy, and just a bit homesick. It might be that, at the moment you are reading this post, I am staring down the mouth of a lion. Or maybe I am sleeping. Or, perhaps having a cocktail. Regardless, I am not sitting in the rain in Seattle. I am (hopefully) enjoying the splendors of South Africa. 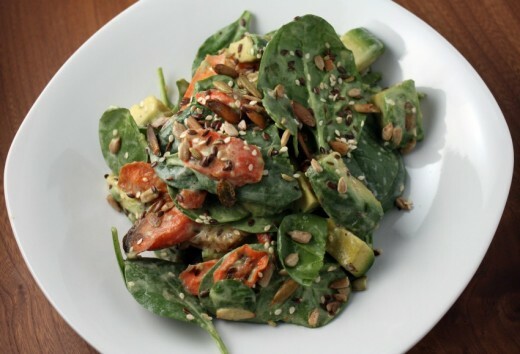 I have made some yummy things in March over the years and I hate to think of those dishes languishing without any one looking at them, so I’m including my favorites here. 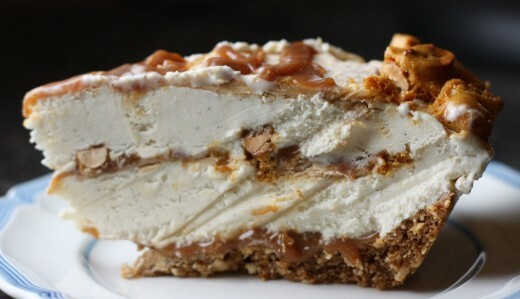 If you want to impress, really impress, you should make this Peanut Brittle and Caramel Crunch Ice Cream Pie. It weighs over five pounds. 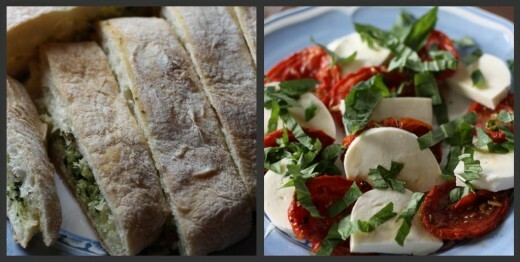 Ina Garten’s Garlic Ciabatta Bread and her Roasted Tomato Caprese Salad together in one post! 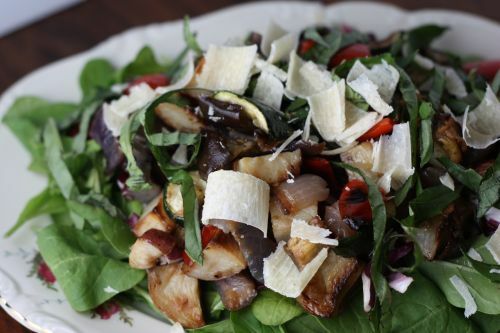 Mediterranean Roasted Vegetable Salad is one of the first great salads I ever made. Pizza Bianca and the beginning of my Jim Lahey (he of no-knead bread) obsession. 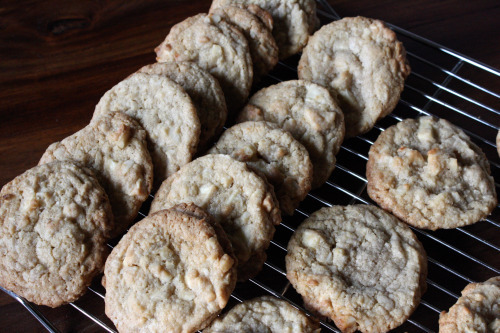 White Chocolate Macadamia Nut Cookies – the kind that you used to get at Mrs.Field’s – except about a million times better. 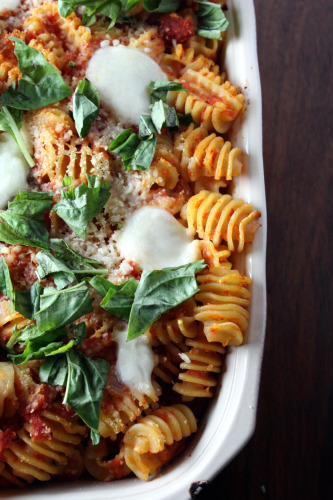 Sometimes you just need a lot of fresh tasting pasta to make the day better. Jamie Oliver is a really good helper on those days. 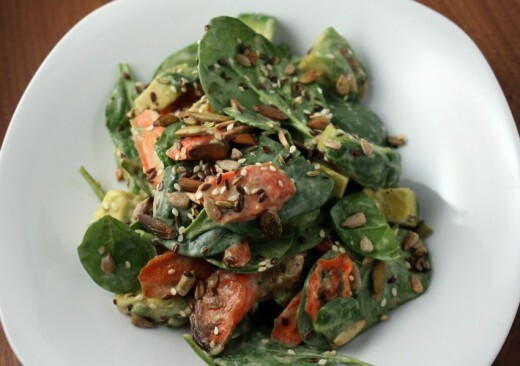 In my mind, there is very little that Yotham Ottolenghi does that is not amazing and delicious. 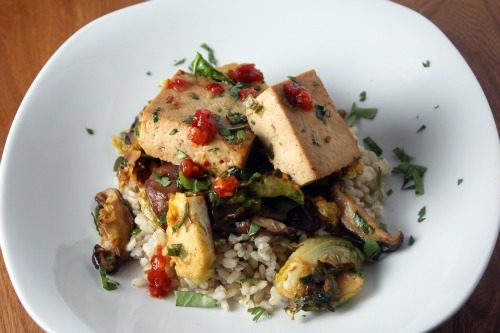 In this dish, he takes two kind of polarizing ingredients, tofu and brussels sprouts, and brings them together in the most delicious way imaginable. Another dish from Plenty. 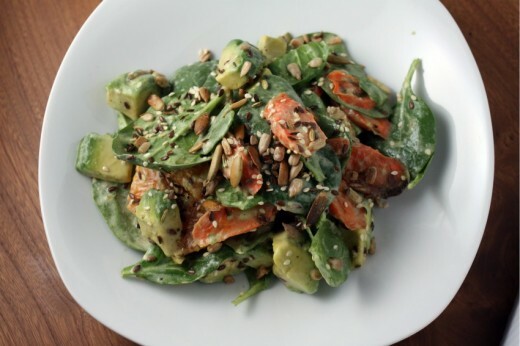 So nice when you want a salad that’s a bit different but still light and clean. 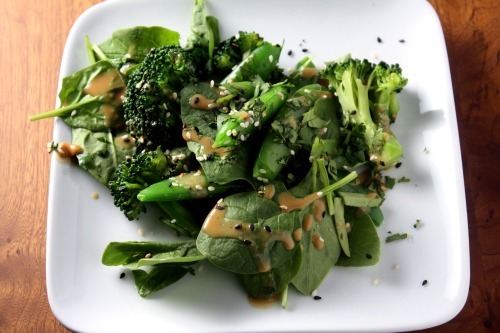 Broccoli and Sweet Sesame Salad. Every October, Randy and I go to a most amazing auction for the Boyer Clinic. It is a cause very near and dear to our hearts. Graham did preschool and his very first round of speech therapy at Boyer and it was a beacon of light during a very dark and confusing time for us. Because we had such an amazing experience there, we have continued to support them in multiple ways. We attend the auction, we donate to the auction, we ask friends to donate to the auction, and Randy is on the board at Boyer. An event like this auction is something we don’t often experience in Seattle. People dressed to the nines in a lovely room bidding on amazing items. Seattle is a city that is casual to a fault, so this auction feels extra fancy. We have been going for many years and something that is always donated is a safari in South Africa. In October of 2010, that trip came up in the live auction, and Randy starting raising his paddle. Now, this was shocking to me. We had not discussed it beforehand. Usually we have a little pow wow before the live auction begins where we talk about things we are interested in buying. We decide on what items and how much we are willing to spend. It almost always happens that the bidding goes out of our reach very quickly. But there we were. Trip to South Africa on the line, Randy raising his paddle, and me asking him, “Are you f***ing crazy?” Everyone at our table was egging us on, promising to watch our children for us, until whatever imaginary number Randy had in his head came and went and he put his paddle down. That was when the auctioneer came over to us and asked the magic question, “If we can get you another trip for your top bid price, would you take it?” And Randy, again without consulting me, nodded his head yes. I was simultaneously horrified and exhilarated. And here it is. We fly out tonight and have a stop in London. We arrive in Capetown the morning of March 15th. We spend five days there and then board another plane to take us to Durban. From there we have a 4 hour car ride to a game park where we will spend the next six days. Considering we are flying to the country that is as far from Seattle as you can get, and considering we are spending a small fortune for this trip, I know very little about what we are doing. I know there will be a day trip down to the Cape of Good Hope and another day trip to the wine country near Capetown. I know, once we get to the safari part of the trip, there will be elephants, lions, and giraffes. And many other animals. At least I hope there will be. I know there will be an optional trip to Victoria Falls. And that’s about it. I know I have some new camera equipment and I hope to take a million bazillion good photos, and I hope my kids are all right without us. I’m feeling a bit (a lot) guilty about leaving them here without us. So, I have one food post waiting in the wings. And I hope to be able to eek out another post while we are in Capetown. I also hope to be able to upload photos to my Flickr account, but we shall see. It might be that you don’t hear from me again until early April. In that case, I’m sure I will have some stories to tell.